House to House Heart to Heart is one of the most effective and cost-effective ways you can evangelize your entire community! The cost of House to House Heart to Heart is based on two components: printing and mailing. In short, it’s 15 cents to print a copy of HTH and 17 cents to mail that copy to your community. So for 32 cents you can send a personalized copy of HTH to a family in your neighborhood. That’s less than $2.00 per family per year! 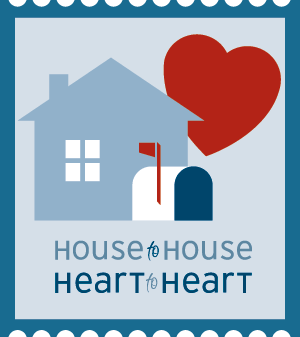 When you sign up for the House to House Heart to Heart program, you will receive all six issues per year. Constant teaching is the most effective way to evangelize through the mail. It builds name recognition and increases the likelihood that a person will visit. The cumulative effect of teaching helps soften hearts and change minds. If you can only afford to print for your major events (VBS, Gospel Meetings, etc. ), then we can work with your budget and schedule. We only have one requirement: the printer requires each church to print at least 1,000 copies. You don’t have to print in increments of 1,000. If you want to print 1,749 copies, we can do that. If you want to print 17,490 copies, then we can do that too. It’s always 15 cents per copy, regardless of how many you print. Let’s face it: The Post Office can be complex and intimidating. Paperwork, forms, bureaucracy, and rules are hard to keep up with. Let us handle that stuff for you! Most congregations opt to utilize our direct mail service. For only 17 cents per piece, we’ll handle every part of your mailing. We’ll do the paperwork and pay the postage; we just need you to choose which routes you want to cover. That’s it. You tell us where to send it, and we’ll make sure it gets there. Have an upcoming event? We’ll make sure it gets there in time. Want to rotate which routes receive HTH? We can handle that too.